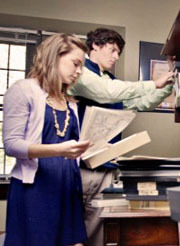 Through a History Department Fellowship, Lauren Peterson ‘13 and Jordan Redmon ’13 worked with consulting librarian, Carol McCarley to organize Foote’s collection. They helped transfer the items to archival storage and to write the finding aid. “Foote Fellows,” Rhodes College Archives and Special Collections, accessed April 18, 2019, http://archives.rhodes.edu/items/show/47.